EDITOR’S NOTE: The following news release about the restart of the Large Hadron Colider is being issued by the U.S. Department of Energy’s Fermi National Accelerator Laboratory on behalf of the U.S. scientists working on the LHC. Fermilab serves as the U.S. hub for the CMS experiment at the LHC and the roughly 1,000 U.S. scientists who work on that experiment, including about 100 Fermilab employees. Fermilab is a Tier 1 computing center for LHC data and hosts a Remote Operations Center to process and analyze that data. Get more information about Fermilab’s role in the CMS experiment and the LHC. See a list of Fermilab scientists who can speak about the LHC. 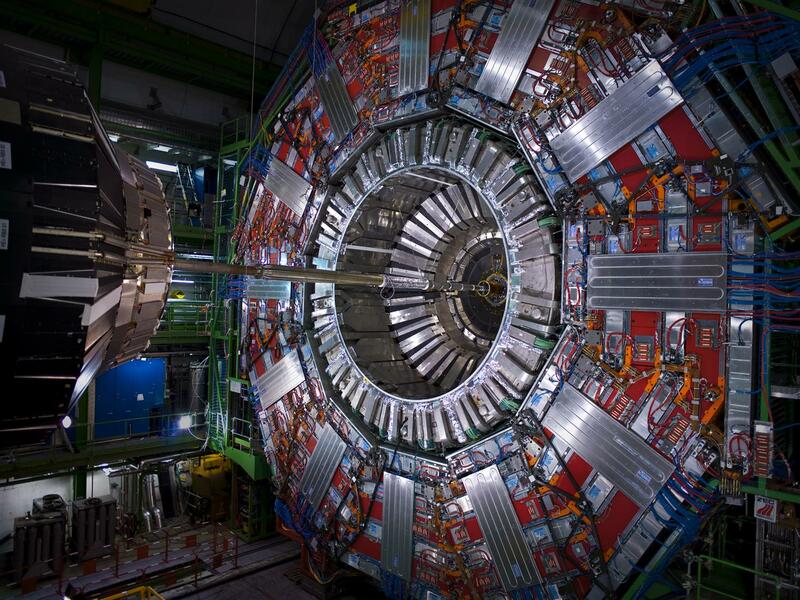 Earlier today, the world’s most powerful particle accelerator began its second act. After two years of upgrades and repairs, proton beams once again circulated around the Large Hadron Collider, located at the CERN laboratory near Geneva, Switzerland. These collisions – hundreds of millions of them every second – will lead scientists to new and unexplored realms of physics and could yield extraordinary insights into the nature of the physical universe. A highlight of the LHC’s first run, which began in 2009, was the discovery of the Higgs boson, the last in the suite of elementary particles that make up scientists’ best picture of the universe and how it works. The discovery of the Higgs was announced in July 2012 by two experimental collaborations, ATLAS and CMS. Continuing to measure the properties of the Higgs will be a major focus of LHC Run 2. During the LHC’s second run, particles will collide at a staggering 13 teraelectronvolts (TeV), which is 60 percent higher than any accelerator has achieved before. The LHC’s four major particle detectors – ATLAS, CMS, ALICE and LHCb – will collect and analyze data from these collisions, allowing them to probe new areas of research that were previously unattainable. At 17 miles around, the Large Hadron Collider is one of the largest machines ever built. The United States played a vital role in the construction of the LHC and the huge and intricate detectors for its experiments. Seven U.S. Department of Energy national laboratories joined roughly 90 U.S. universities to build key components of the accelerator, detectors and computing infrastructure, with funding from the DOE Office of Science and the National Science Foundation. The U.S. contingent was part of an estimated 10,000 people from 113 different countries who helped to design, build and upgrade the LHC accelerator and its four particle detectors. In addition to the scientists pushing toward new discoveries on the four main experiments, the United States provides a significant portion of the computing and data analysis – roughly 23 percent for ATLAS and 33 percent for CMS. U.S. scientists on the ALICE experiment developed control and tracking systems for the detector and made significant contributions in software, hardware and computing support. U.S. scientists also helped improve trigger software for data analysis for the LHCb experiment. U.S. institutions will continue to make important contributions to the LHC and its experiments, even beyond the second run, which is scheduled to continue through the middle of 2018. Universities and national laboratories are developing new accelerator and detector technology for future upgrades of the LHC and its experiments. This ongoing work encourages a strong partnership between science and industry and drives technological innovation in the United States. For more information on the U.S. role in the Large Hadron Collider, visit the USLHC website. For a series of videos on the LHC featuring U.S. scientists, visit this YouTube playlist. For the CERN press release on the restart of the LHC, please click here. CERN, the European Organization for Nuclear Research, is the world’s leading laboratory for particle physics. It has its headquarters in Geneva. At present, its Member States are Austria, Belgium, Bulgaria, the Czech Republic, Denmark, Finland, France, Germany, Greece, Hungary, Israel, Italy, the Netherlands, Norway, Poland, Portugal, Slovakia, Spain, Sweden, Switzerland and the United Kingdom. Romania is a Candidate for Accession. Serbia is an Associate Member in the pre-stage to Membership. India, Japan, the Russian Federation, the United States of America, Turkey, the European Union, JINR and UNESCO have Observer Status.